Over the last few years, we have seen large organisations implement analytical technologies, like Data Warehousing, Business Intelligence (BI) and even Big Data Analytics, and we have seen some of them achieve the objective of a positive Return on Investment (ROI) on these initiatives. However, does the same reality apply to small to medium sized companies? Can they reap the benefits of analytics, without going over their IT budget, which is often quite limited? So what can be done to change the minds of CIOs and CFOs of small to medium sized businesses, especially when their budgets are tight? Well, Nuclear Research has examined a number of Business Analytics deployments at companies of various sizes and found three facts about analytics that CIOs should take into consideration – which I would like to expand upon. The operational costs of BI, which typically include software licenses, hardware maintenance, personnel, consulting and training can be managed to stay well within most companies’ budgets. Additionally, ongoing support costs can be held at the bare minimum, as according to this research, the average operation only needs a third of one IT administrator’s time for support. In fact, research has shown that the running costs of analytics are actually quite low compared to the benefits an organisation can achieve if it is done correctly. To address the CAPEX side of the balance sheet, small to medium organisations should really consider BI in the cloud, as it can actually be managed as an affordable option. Services in the cloud offers access to databases and BI toolsets that they would never have had the CAPEX budget for in the past. So by “renting” cloud-based BI technologies, and closely managing their operational costs, it allows these organisations to cost-effectively reap the benefits that BI and analytics can deliver. Over the last few years vendors have released toolsets that make implementing BI and analytics much easier, especially for small organisations that typically do not have many different transactional systems. For example, visual analytics is becoming increasing popular globally. It allows organisations to view their data in a more user-friendly way. So instead of data being in one ‘big dump’ that both employers and employees potentially do not understand, or they don’t even know what exactly is contained therein, through visual analytics, an organisation of any size, can turn this data into more meaningful information that they can actually use. Some of the better data visualisation tools can actually be used against many operational / transactional databases simultaneously. The data visualisation tool is then configured to do the necessary integration “on the fly”. This enables a small organisation to get a good integrated view of its data, without first investing in more costly data warehousing infrastructure, toolsets and implementation. Of course, here I have to caution again that this is good for a “current” view of the data, but it becomes more problematic to maintain a consistent single view of the truth over an extended time period. This newfound understanding of the organisation’s data can then be used to propagate the relevant information to a larger portion of the workforce. This aids them in their actual day-to-day job functions to work faster and smarter. Given that the data is delivered in a more visual and user friendly way means the employees can digest and use this information much quicker. Another example is the new generation of productivity tools, like BIReady, that populate data warehouses semi-automatically. These tools are maturing fast and are getting wider acceptance and success in the BI space. These tools, in particular, make it much faster and more cost-effective to implement end-to-end source-to- analytics ETL. Many of these toolsets are hosted in the cloud as well. As we know, most organisations train their staff with the intention of ensuring then that they make the right decisions, when required, and continue to make their businesses even more profitable. However, research has proven that even the best employees can underperform if they don’t have access to the right information when they need it. This, of course, then often leads to bad decision making. Analytics has proven that if decisions are made on facts and data from analytic applications, employees in general make better decisions that increase revenue, decrease costs and thereby increase the ROI on the initiative. Identify best-selling products, and analyse their spread across all distribution channels. Identify customers that are cutting back on their purchases so that special inducements can be offered to retain them. Monitor social media sites, and perform sentiment analysis to gain insights into product launches, company or brand reputation, or potential service issues. Perform “what-if” analyses to determine how profits would be affected if sales were to increase or decrease by various percentages. Implement “live” dashboards and scorecards that enable executives and supervisors to quickly recognize operational exceptions or KPIs that start to trend outside of accepted ranges. Receive real-time alerts on mobile devices when this occurs so that immediate corrective action can be taken. Compare period-to-date sales for this period with the previous, and forecast what sales are likely to be for the entire period. Monitor marketing campaigns in real time to decide if it is succeeding, whether it should be reinforced or cancelled. Track customer orders and desired ship dates against finished-goods inventory, and adjust the manufacturing production cycle and supply chain logistics to reduce inventory carrying costs. Compare daily operations with strategic objectives, and recognise when they are not aligned. In general, replace hunches with data-driven analytical decisions. So given this, surely implementing analytics is not essential for bigger businesses only, but also for small to medium sized organisations too. 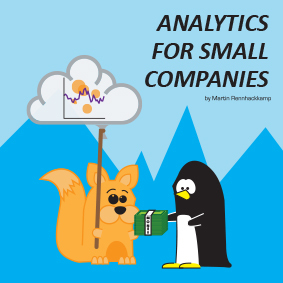 I urge small to medium sized organisations to really investigate what analytics can mean for their businesses. Instead of getting stuck on technology discussions and objections, rather look at it as a means of managing your data more smartly, to allow you to reap the benefits of more intelligent and better informed decision-making into the future.